Painted Ladies & Kellie Castle – History. Heritage. Hilarity. As you may have noticed, we have been very quiet over the last couple of months. Really, this is due to our PhD’s and other heritage projects taking over our lives which we whole-heartedly apologise for. To prove how busy we have been, over the next couple of months we will be presenting some of our research via several talks including HERstory Influential Women of the Southside at House for an Art Lover in August (now sold out) and another talk for Doors Open Day in September. We are also over the moon to announce that our article, Fivers, Footnotes and Frivolous Language: Women in Scottish History has been published in The Drouth (Spring 2017) which if desired can be purchased from the CCA in Glasgow or here. Castle grounds – Nice for a wee wander. However, last week I managed to take some well needed time off……well sort of. I took a wee trip up to Kellie Castle and Gardens, roughly 5 kilometres north of Pittenweem in the East Neuk of Fife, mixing work with pleasure as the castle houses a mural by Phoebe Anna Traquair (1852-1936). The Irish artist and designer is probably best known for her painted mural work in Edinburgh including the Chapel at the Royal Hospital for Sick Children and, of course, Catholic Apostolic Church now the Mansfield Traquair Centre. Traquir not only designed and executed several large-scale painted murals but she also worked in a range of other mediums including metalwork, enamels, parchment illumination and needlework. Traquair mural in Kellie Castle Dining Room. Kellie Castle houses one of Traquair’s decorative panels dating from 1897 in the castles drawing room. The panel which was covered up by white paper for many years depicts a procession of girls following a ‘wee cupid’. The image included in the blog post has been taken from the NTS website, as photograph was not permitted during the tour. Hew Lorimer’s studio with tools and sculptures. The castle houses an array of smashing exhibits including examples of sculptor Hew Lorimer’s (1907-1993) sculptures, tools, designs and other objects from his studio. Kellie has been in the Lorimer family for years, and thus contains several great examples of Hew’s father’s furniture – again I wasn’t allowed to take any photographs. Hew’s father, Robert Lorimer (1864-1929), was an architect and designer who is probably best known for his work with the Scottish War Memorial in Edinburgh. The memorial was designed and executed by several stellar artists, designers and craftspeople including Gertrude Alice Meredith Williams (1877-1933), her husband Morris Meredith Williams (1881-1971), Douglas Strachan (1875-1950) and Phyllis Bone (1894-1972). Although some of the rooms have been cobbled together with mismatched objects from varying eras, styles and fashions, overall the castle is a great place to visit for a wee day trip for the history geek, garden lover or just big kids who wish to escape inner-city life. By-the-way there is also an adventure play park and a field of alpacas who are actually friendly enough to have a conversation with – if you are that way inclined. To find out more about Kellie Castle please click here. 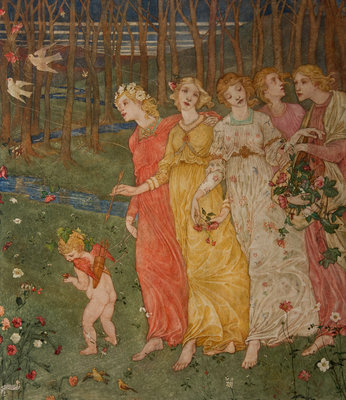 Cummings, Elizabeth, Phoebe Anna Traquair 1852-1936, pp 60.